Getting a good quality cut on most flat paper and card like materials generally has always been a requirement for my work, especially to get an accurate, sharp edge. 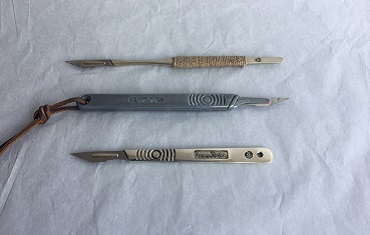 Over the years, I have tried most types of cutter but for this job my trusty Swann Morton No.3 Scalpel excels. It has been with me since my foundation course days, simplicity and quality, with an unrivalled edge and simple blade changing, it is always in reach and always ready to use. Mr WR Swann, Mr JA Morton and Miss D Fairweather founded the business in August 1932 to manufacturer and sell razor blades. After many years of research and development the emphasis was changed from razor blades to surgical blades. 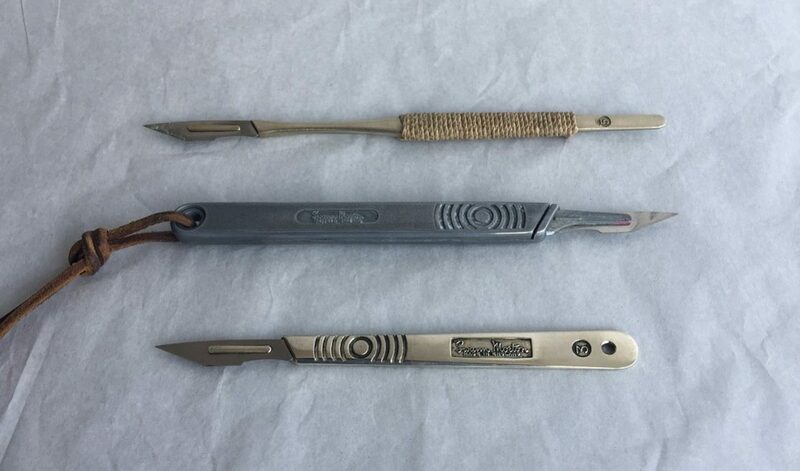 With the market for surgical blades growing considerably. By 1957 Swann-Morton was manufacturing over 38 million blades each year. During the mid-40’s, Mr JA Morton decided to leave the company to pursue other interests leaving Walter Swann and Doris Fairweather as remaining co-directors. Mindful of the future security of the company, the workforce and its founding principles a trust was formed to administer the company within which the employees had a 50% share and the remaining 50% placed in a charitable trust. It is this unique culture that inspires quality and commitment and Swann-Morton’s staff are very proud to be a part of this. Their commitment to quality and company ethics is outstanding and was at the time very forward looking and is now very admirable. Their ethical trading policy, conflict materials statement and their supplier code of conduct are all outstanding but the product has remained with no compromises ever considered, just an expanded range to cover wider specialised applications. I must admit though, in my early years of usage I did manage a couple of pretty spectacular ‘bad cuts’. No loss of fingers or other body parts but loss of copious amounts of the red stuff! A small and affordable price to pay for the apprenticeship.